WASHINGTON — More than eight months after winning the election, President Donald Trump on Thursday declared Hillary Clinton's defeat "the greatest loss in the history of American politics," while painting the Russia investigation as a "total fabrication" by Democrats to distract from their failure to win the White House and lack of message. 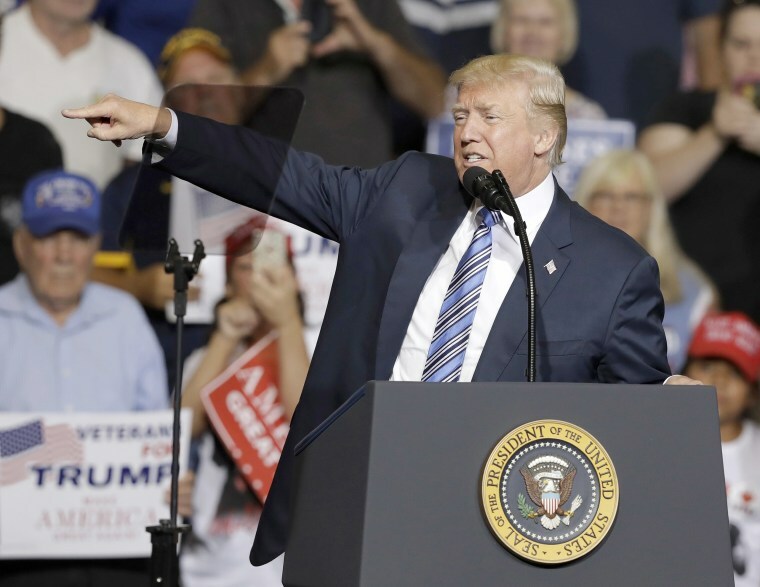 "The reason why Democrats only talk about the totally made-up Russia story is because they have no message, no agenda and no vision," Trump told a raucous crowd of supporters gathered for a campaign rally-style event in Huntington, West Virginia. The president called probes into alleged collusion between his campaign and Russia during the 2016 election "demeaning" and "fake." "Most people know there were no Russians in our campaign — there never were," Trump said. "We didn't win because of Russia. We won because of you, that I can tell you." "Have you seen any Russians in West Virginia or Ohio or Pennsylvania?" Trump continued, listing states he won last year before quizzing the crowd: "Are there any Russians here tonight? Any Russians?" The president had another target in mind for those looking to investigate something: Hillary Clinton's missing emails. "What the prosecutors should be looking at are Hillary Clinton's 33,000 deleted emails," Trump said, prompting chants of "Lock her up! Lock her up!" from the crowd, a common occurrence during the 2016 campaign. Democrats, he said, "can't beat us at the voting booths so they're trying to cheat you out of the future and the future that you want." Just as during the campaign Trump primed his supporters to doubt the election results if he lost — he repeatedly deemed the system then as "rigged" — the president planted seeds of doubt about the integrity of the investigations into Russian meddling. "I just hope the final determination is a truly honest one, which is what the millions of people who gave us our big win in November deserve and what all Americans who want a better future want and deserve," Trump said. His fiery rebuke comes hours after a report that Special Counsel Robert Mueller has impaneled a grand jury in Washington to investigate alleged ties between the campaign and Moscow. The president's personal lawyer, John Dowd, told NBC News that "with respect to news of a federal grand jury being impaneled, we have no reason to believe President Trump is under investigation." Making good on a promise earlier in the day for a "big announcement" during the rally, Trump invited West Virginia Gov. Jim Justice, a Democrat, on stage for a "very, very large announcement" — a point the president drove home by gesturing with his hands to show the governor’s size. Justice announced he would change parties, becoming a Republican and notching another statehouse executive seat for the GOP. "Tomorrow, I will be changing my registration to Republican," he said. "As a coach, I would tell you it’s time to run another play." Justice also rallied the crowd against the Russia investigations, asking, "Have we not heard enough about the Russians?" And while Republicans in Congress have signaled they would like to move on from failed GOP efforts to repeal and replace Obamacare, Trump on Thursday wasn't yet ready to concede the fight. The president lamented the unsuccessful attempts as "incredible," and demanded of lawmakers, "You have to do it. Nothing in life is easy, but Congress must not give in." "Call everybody," Trump told the crowd. "Get them to have the guts to vote to repeal and replace Obamacare — which is a disaster."